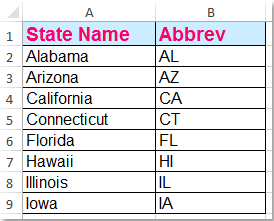 How to quickly delete every other row in Excel? 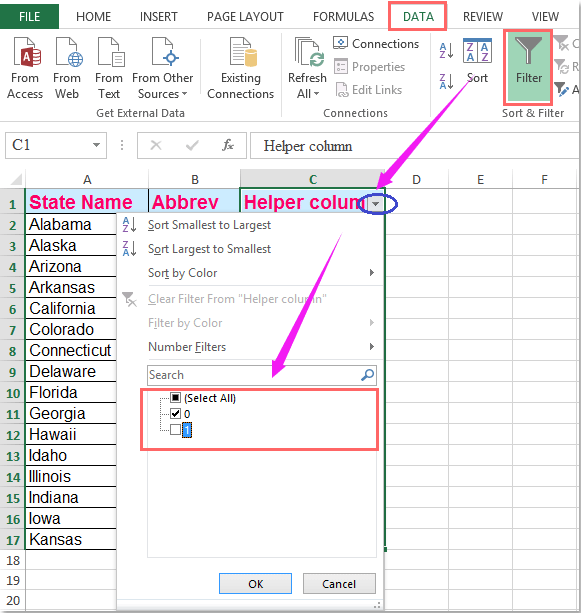 If you want to quickly delete every other row or column in Excel, the main point is how can you quickly select every other row or column first and then apply the delete operation to them. 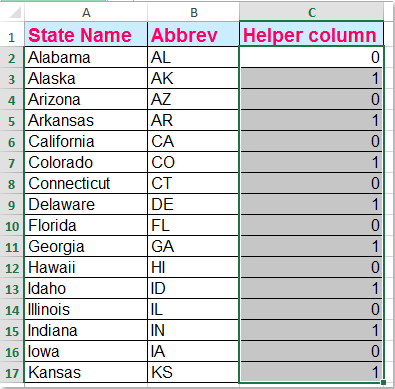 And this article will show you some tricky things about how to select every other row or column first and then delete them quickly. 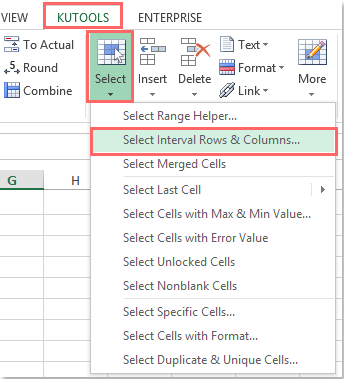 Kutools for Excel's Select Interval Rows & Columns utilty can help you to find and select every other or nth rows or columns, and then you can do some operations as you need. Kutools for Excel: with more than 200 handy Excel add-ins, free to try with no limitation in 60 days. Download and free trial Now! Amazing! Using Efficient Tabs in Excel Like Chrome, Firefox and Safari! 4. At last, you can delete the helper column C as you need. Actually, VBA macro is also a good choice to resolve this problem. For a starter user of Microsoft Excel, using VBA macro is a little complicated. 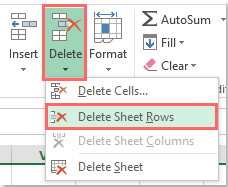 The Select Interval Rows & Columns utility of Kutools for Excel can help you delete every other row quickly. Kutools for Excel : with more than 300 handy Excel add-ins, free to try with no limitation in 60 days. 1. 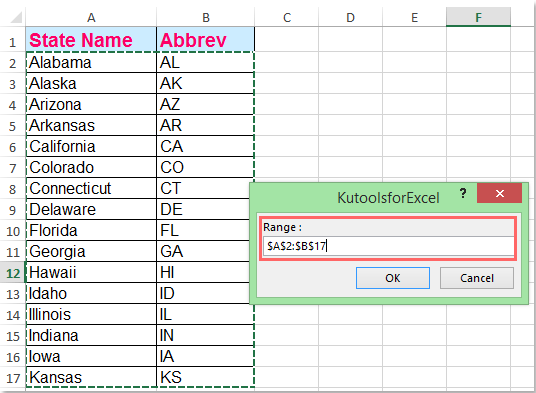 Select the range that you want to delete every other rows, and then applying this utility by clicking the Kutools > Select > Select Interval Rows & columns…. 2. In Select Interval Rows & Columns dialog box, specify the settings as following screenshot shown, and click OK button to select every other rows first. 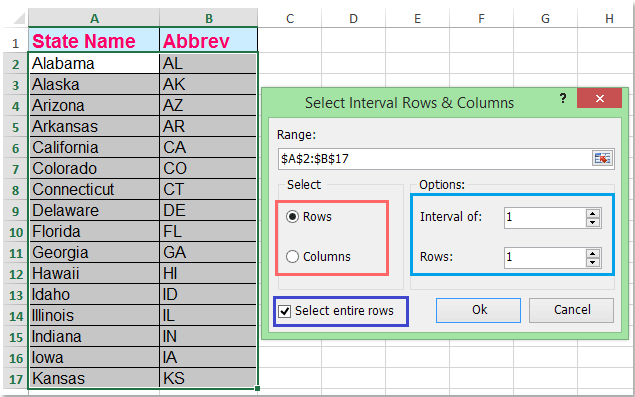 Click to know more about this Select Interval Rows & Columns feature. With this feature, you can also delete every nth rows or columns as you need. Download and free trial Kutools for Excel Now! Bring handy tabs to Excel and other Office software, just like Chrome, Firefox and new Internet Explorer. Amazing! Increase your productivity in 5 minutes. Don't need any special skills, save two hours every day! 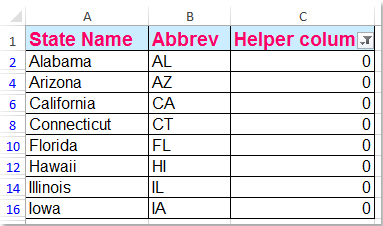 Merge Cell/Rows/Columns without Losing Data. Combine and Consolidate Multiple Sheets and Workbooks. Compare Ranges, Copy Multiple Ranges, Convert Text to Date, Unit and Currency Conversion. 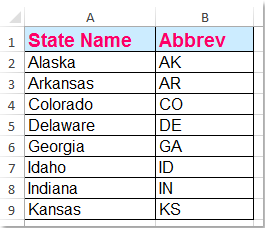 An easy way to put 0 or 1 in the column instead is to add a formula column: =IF(MOD(ROW(), 2) = 0, 0, 1). That might help if you'd rather not type 0,1,01, etc. 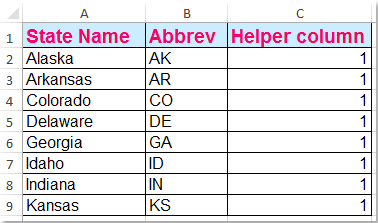 another way is to add a new column in front of your data, so column A is blank, then just enter a b a b a b as you go down the rows in column A - so "a" in A1, "b" in A2, "a" in A3, "b" in A4. 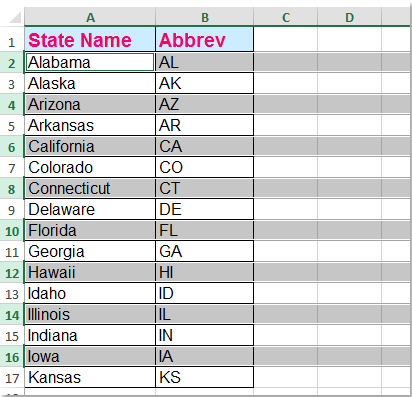 then you can drag the new "a" and "b" cells down for all rows of data. 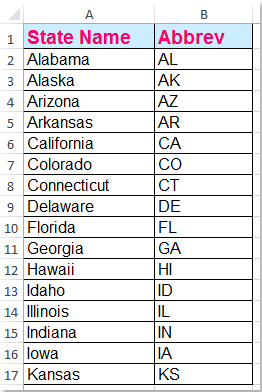 then sort column A alphabetically, and you get all the odd rows with an "a" at the top and all the even rows with a "b" at the bottom. this is probably the easiest way. This is actually very useful if you have a large number of rows and can't enter the 2 settings in manually. if you drag 0,1 down, it continues to 2, 3, 4...but if you drag a,b down, it will repeat as a,b,a,b...all the way down. Thanks!